“Christianity has given us a country where 11 year olds dance for adult men who throw dollars on the stage. “Christianity gave us a church that molested children and sold out their flock (Covington) to the left. Predictably, many Christians were highly offended by the Tweet, and let Cernovich know about it. While the response by many was obviously orchestrated by Cernovich to attract attention to his latest documentary film he just released called ‘Hoaxed’, the reality is he struck a chord – positive and negative – with many people, with a significant number not getting what he was really saying. Cernovich also released an accompanying book with the documentary film, which I have been reading, and would highly recommend it for those wanting a deeper look into the strategy and tactics associated with fake media. Let’s break down what Cernovich said and my thoughts on it. I’m going to take each sentence and comment on it. A lot of interesting comments were made on his Twitter account concerning this assertion, with many pointing to the left or the devil as the reason behind it. While that’s true, it misses the point entirely. The point is Christianity has refused to dig in and fight the war against the left and evil – both in the church and the nation, resulting in a boldness from our enemies that know the majority of people alleging to be Christians will do nothing about it but complain on the Internet. Meanwhile, they keep on flaunting their sin and lawbreaking in the faces of Christians, as they move to criminalize the very thoughts and words revealed by God almighty in the Holy Scriptures. Many that name the name of Christ are more interested in gaining the approval of the world, rather than enforcing justice upon those that attempt to destroy the church and the nation. This is of course happening in other nations as well. As for the comment by Cernovich above, what he’s pointing out is Christians have allowed the cultural environment to be formed in a way that provides a small boy as entertainment for perverts. We got the usual pointing and shrieking from Christians, but no action has been taken to call the adults that participated in the abomination to account. That is done by not only exposing the evil, but by taking legal action against those that were part of it. This next statement was meant directly for the Catholic church, which Cernovich was raised in. There is not much that can be said here to refute his claims, other than Christianity entails far more than the Catholic denomination. Also, it’s not the only “Christian” institution that has had child abuse problems in it. That said, the issue is institutionalized pedophilia that Catholic leaders refuse to do little about, other than talk about how sad they are for the victims. On the second part of his statement, that’s also another dark blot on Catholicism, after many of its cowardly leaders blamed the young men for the encounter, rather than those that perpetrated it. It’s apparent that Cernovich is saying Christianity has gotten so weak it not only has refused to confront evil directly, via action, but in many cases its leaders align themselves with our enemies in order to remain in their good graces. More than likely many of these so-called leaders are really our opposition posing as wolves in sheep’s clothing, and when the opportunity arises, they go on the offensive against confused and unsuspecting Christians. The answer Cernovich gives for weak Christianity is a moderated form of Islam, whatever or wherever that may happen to be. One of the major problems with his statement is it’s hard to know if he really means it, or if he’s trolling for the purpose of getting a reaction and generating buzz for his documentary and book. I tend to think it’s the latter, but there have been times in the past when Cernovich has castigated Christians for what he calls Islamophobia. The problem there is there is no such thing as Islamophobia for a Christian. It is an enemy religion trying to gain the upper hand on Christianity in order to rule the world based upon Sharia law. That’s not Islamophobia, it’s a fact repeated many times by Muslims. Based on how most of you “Christians” acted yesterday and today…. Let’s just say, You sure had me fooled! You’re hateful, angry people who lash out at Islam, insult moderate Muslims like my friends, and can’t take your own medicine. 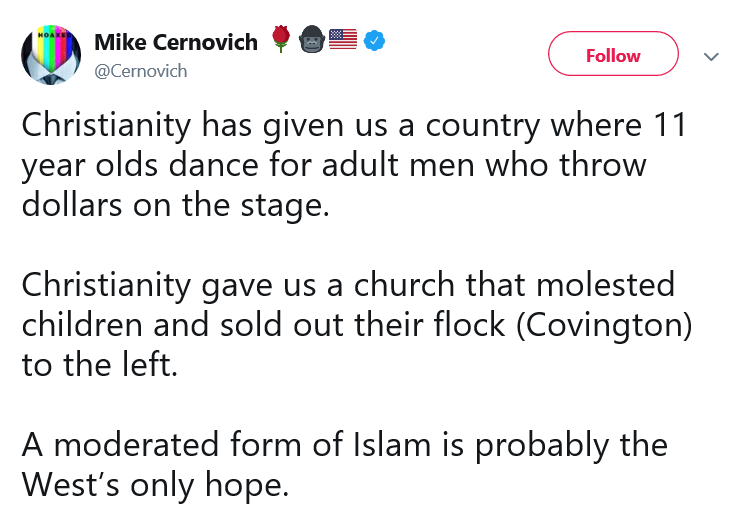 Even taking into account his trolling for the documentary and book, this gives the impression Cernovich does in fact favor Islam over Christianity, and has drank the moderate Muslim kool-aide. Again, he is an expert troll, and he could be simply doing this in order to keep the buzz going; at least in part. At the same time, the level of vitriol coming from Cernovich suggests this is more than just trolling, but representative of what he really believes about Christians. It also suggests he really believes some form of non-existent moderated Islam is the answer for the West. While I would never agree with Islam being of value to the West or anywhere for that matter, I do agree Christianity must once again become the salt and light of the world, taking dominion over the world as we’re called to do. One of the great failures of Christianity has been in regard to justice on this earth – there has been very little based upon what the Scriptures teach. The false idea of mercy floating around Christendom today is only a partial truth. 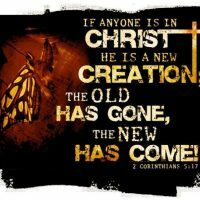 Of course we’re saved by repenting of our sins and having faith in Jesus Christ. But that’s only the door into the rest of God’s purpose for creation, which is to have a people bear His image. Part of His image is justice, and justice is based upon His moral laws and the accompanying penalties. 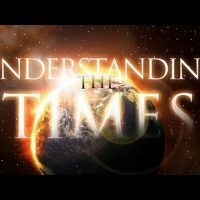 I think some of the penalties have changed under the new covenant, but not all of them. For example, all murderers should be executed if found guilty based upon two or more witnesses. Our job is to engage in teaching the commands and laws of God to the nations (get my book on Making the Great Commission Great Again, which talks about that subject), placing God’s law into national law codes, and supporting the administering of justice against evildoers. Notice that God isn’t the only one that hates iniquity, but the Psalmist takes up that same attitude toward the wicked and those that engage in lawlessness. If you know the Bible at all, you’ll at this time have probably already thought of the verses below. This is talking about a posture we’re to have toward our enemies, not forsaking the justice that is due them in this world if they are lawless and engaging in lawless deeds. In another part of the Bible it defines what this love meant. It points to giving them food and water if they are in need. 17 Recompense to no man evil for evil. Provide things honest in the sight of all men. 18 If it be possible, as much as lieth in you, live peaceably with all men. 19 Dearly beloved, avenge not yourselves, but rather give place unto wrath: for it is written, Vengeance is mine; I will repay, saith the Lord. 20 Therefore if thine enemy hunger, feed him; if he thirst, give him drink: for in so doing thou shalt heap coals of fire on his head. 21 Be not overcome of evil, but overcome evil with good. This also relates to an eye for an eye and a tooth for a tooth. The point is that we are not to take the law into our own hands, but go through the judicial system. In regard to the posture I referred to earlier, this is done so we aren’t overcome by evil, and participate in evil ourselves by taking revenge or refusing the necessities of existence to our enemies that may have done us wrong in the past. Also, this isn’t necessarily talking about the type of people God tells us to hate, it probably involves personal enemies or those that persecute us. That’s different than the criminals that are breaking the law and doing us harm because they’re evil, violent law breakers. We are to engage in justice when dealing with those breaking the laws, not take vengeance on our own, or take justice into our own hands. That’s what it means when we are told that we are to submit to God taking vengeance. That comes through the legal system, not personal vendettas. Cernovich, in my opinion, is far too gracious to Muslims, and in my view, misrepresents who and what they are in real life. He has also made statements in the past about things no Christian could agree with, such as with Bradley Manning, who had been accused of leaking hundreds of thousands of classified documents to WikiLeaks, and after being sentenced to 35 years in a military prison, decided he was now going to identify as a woman. Manning has showed up at events put on by Cernovich, and Cernovich demands if people talk to him they must do so in a way that aligns with his new “gender”. In other words, you have to pretend he’s a woman if you want to interact with him at a Cernovich event. As for his trolling statements, they are in my view, at least the first two, based in fact. Western Christianity has caved, for the most part, to the SJWs, which have converged most of the churches. We no longer hate the wicked as God does, and in fact have turned more into therapy organizations that have taken on the psychobabble of the psychologists and psychiatrists, whose training is largely in opposition to Biblical, Christian teaching and revelation. We must resist the temptation of seeking the approval of the world, reject feminism, Islam, socialism, and a host of other enemies that have infiltrated the church. We must stand up again and not let our fears determine our decisions in life in relationship to the church and our families. We must once again embrace and obey the commands and laws of God as our standard of behavior and righteous living (not our salvation or justification), and model them for the world to see, and encode them in the legal codes around the world. Part of the Great Commission which has been ignored for a long time is we are to teach the nations to obey everything Jesus taught the disciples. That includes the moral laws of God, among other things. Forget about the lie we’re to hate sin and love the sinner. God through the Scriptures clearly states that’s not what He demands or expects of us; we are not greater than God that we aren’t to follow His example and bear His image in that area of life. Some of the tools we can use to put the fear of God in evildoers and the wicked again is to get much more aggressive with lawsuits against them, focus on boycotts until they accomplish the expected outcome (don’t start boycotting every business or institution as some have suggested, as it creates burnout and confusion), teach the laws and commands of God, and develop a penalty phase of justice based upon Biblical revelation, as the penalties remain in effect to this day (as mentioned earlier, some no longer apply). Last but not least, church leadership needs to start wielding its excommunication arm once again, getting rid of those that refuse to embrace the sound doctrine being taught and lived out by the church. It’s the fear of taking responsibility and exercising dominion that has got us to this place, we need to turn that around and once again be the leaders in this world God has created us to be. Finally, in the interim we should start to build alternative institutions so our enemies can’t silent our voices as they have in the past. We should also continue to homeschool our children or build alternative schools with high standards by the administration and self-governance by the students. Increasing the number of Internet school options is also an option for Christian schools and homeschoolers. Some of this is already happening of course, but we need a lot more of it around the U.S. and the world. Mike Cernovich is wrong about Islam, but he is correct in his view that Christianity has failed the West in the sense it is no longer respected in the way it should be as a representative of the image of God in this world. We have lost our way, but Jesus Christ and His people are the only answer for the West and the world as a whole. It’s time to be bold, pray, and take action in the areas and people we have an influence with. We need to start going on the offensive in all areas of life and put our enemies and the devil on the defensive. Our spiritual lives and the spiritual lives of our posterity are at stake. Our enemies have openly declared they will use their influence in any way they can to make laws that make most things we as Christians believe in illegal. They have no interest in negotiating or compromising; it’s all or nothing with them, and we need to be at the place where it’s the same for us. 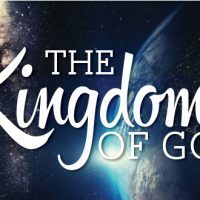 Jesus taught us to teach the nations everything He commanded His disciples, and it’s time we took that command to heart and not just focus on going into the world and preaching the Gospel. Teaching His commands are a big part of that Gospel that has been neglected. It’s time to give it equal time.